I grew up in Nebraska, where it was not unusual for it to reach 100 degrees in the summer. There's a song my mother used to sing: "We're having a heat wave, a tropical heat wave." Anyone know that song? Flash forward twenty years, where it hit 75 degrees in Anchorage on Sunday night and the air was thick and humid in preparation for some serious rain. Mosquitoes swirled about the yard and David and I started to complain about how hot it was. So what did we decide to do? Run the oven cleaner. The temperature on the lower level of the house rose another ten degrees. (In my defense, I'm not a total whiner. This inability to handle heat happens to everyone who moves to Alaska. I lived in New Orleans for four years, and I once lived in an apartment in St. Paul, Minnesota with no air conditioning and the temperature regularly hit 95-100 that summer). So of course I decided to frost a cake. Seriously intelligent move. I had to move the cake out of the kitchen to prevent frosting from melting down its sides. 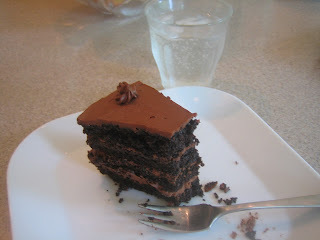 I'm back on schedule with the Cake Slice group this month, after having been on vacation for May's cake pick. In the interest of full disclosure, this cake should have a layer of pudding between the two layers. This pudding, logically enough, required heavy cream. And here is the joy of living in Alaska: the large, normally decently-stocked grocery store near my home had no heavy cream on Sunday afternoon. Zip. None. Nada. So I doubled the frosting and skipped the pudding. Omitting that step saved a lot of time, and judging from the comments of some of my fellow bakers, some serious angst; apparently it was hard to keep the layers from sliding when the pudding was sandwiched between them. This version requires less than an hour of active time, and is seriously, deeply chocolatey, not too sweet and with just a hint of coffee. Even though I'm not much of a chocolate person (gasp! ), I loved it. Position a rack in the center of the oven and preheat it to 350 degrees. Spray two 9-inch cake pans with baking spray with flour and set aside. Sift together the flour, cocoa, baking powder, baking soda and salt into the bowl of your stand mixer, if you have one, or a large bowl if you're using a hand mixer. Whisk in the granulated sugar and set the bowl on the stand mixer. Whisk together the eggs, egg yolk, buttermilk, melted butter and vanilla in a medium bowl. Put the stand mixer (or hand mixer) on low speed and slowly drizzle the wet ingredients into the coca mixture. Scrape down the sides of the mixing bowl and ensure that it is well-mixed. Then add the coffee, mixing until just blended. Using a spatula, fold the mixture together to ensure that the ingredients on the bottom have been thoroughly mixed in; when they have, divide the batter between the two cake pans and bake for thirty minutes, or until a toothpick comes out clean. Cool the cakes on a baking rack while you prepare the frosting. Using a double boiler, melt the unsweetened chocolate over simmering water. When the chocolate is melted, take it off the water and let it cool. In the interim, using a stand or electric mixer, beat the butter until pale yellow and creamy--don't overbeat. Add the powdered sugar and beat on medium speed until it is thoroughly combined, scraping down the sides of the bowl at the end. Then add the chocolate and vanilla, and beat again until combined. To assemble the cake, tip the cakes out from the cake pans. You can leave a slight dome on the layer you designate for the top, but using a serrated knife even off the layer that will be on the bottom. Then slice each layer in two. 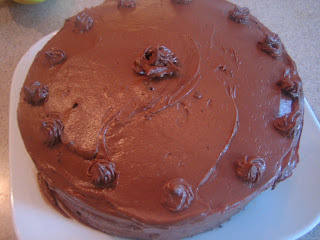 Place the lower half of the bottom layer on the serving plate, then cover with a thin layer of the chocolate frosting. Repeat with the remaining layers, then frost the sides and then the top of the cake, continuing to use the offset spatula. Serves 10 to 12, depending on how thickly you slice it. Absolutely still divine. I'd like to try the pudding layer, but didn't feel like I missed out. Looks delish! Definitely a keeper recipe. I love the 4 layers! There is just something about a tall cake that just gets me every time. I am not a chocolate person either so it was easy for me to dole it out without wanting to lick the knife. You did a great job! And I laughed when you mentioned that dang pudding and the sliding layers. UGH! Tall cakes are the best! 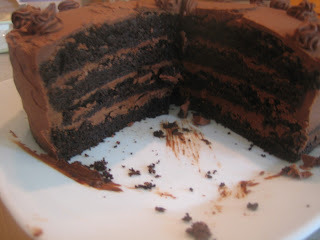 I'm just glad I saw the notes on the Cake Slice site about the sliding cakes--what a pain. it looks so yummy! who wants pudding anyway when you can eat more frosting!! Doesn't look like the heat or lack of heavy cream prevented you from churning out one beautiful cake! I don't even want a slice...I want the whole thing! I am loving the look and adaptations of this cake this month. It seems no matter how it was made, everyone enjoyed it. Your double frosting cake looks great! It doesn't seem to have made a huge difference, although I'd like to try the one with pudding. All I can say is "oy." My days of living in very hot climates are definitely behind me. Talk about C-A-K-E!! I wouldn't be able to stop eating this! It looks like not being about to make the pudding center turned out to your advantage. Your tall slice looks great. I'm jealous of your cake group. That sounds like a fabulous group to belong to. Especially if you get cakes like this from being a member!!! It's really fun--a small group of core bakers, and we bake the same cake from the same book every month. I don't know, that cinnamon swirl cake in April was pretty fabulous, too! Why go for crumbs when you can have a whole extra layer right? LOL! I was also unsure about turning a layer into crumbs but ended up doing it anyway... Whenever I try a recipe for the first time I try to REPLICATE it and then once I see the results and feel comfortable with it I start making twists and variations... But I am glad you did it... you got a tall cake and it looks beautiful! :) Perfect! This cake looks so delicious! I love layer cakes! Oh my. I might need to tackle that cake. We are also getting burned with the heat wave and even the air-cond at times seems not enough. I was looking at the pics over and over and wow, very impressive with your baking skills. Great job in layering and really fabulous. Thanks, Nava! I'm not an expert baker by any stretch--some of the other bakers made cupcakes, which look really awesome, and the cakes with the pudding layer looked extra good. aOh my gosh that cake looks fabulous. Love those layers and frosting in between. Beautiful. I know that song too - they play a bit of it in one of my favorite movies, White Christmas. Now I'll be singing it all day! I'm not really a chocolate person either (gasp! ), but I'm glad you liked this cake! Where is that darn song from? I suppose I could look it up on the Internet, but that's just oo easy. I AM a chocolate lover, and I am certain I would love this cake too. Espresso/coffee in chocolate baked good takes it to a whole new level. I know, 75 degrees is nothing compared to the rest of the country. We have totally lost our heat tolerance! I'm going to have that song stuck in my head all day now! The chocolate cake looks wonderful. The only thing better than chocolate cake is fudgy chocolate brownies!! It's funny you should say that...check out what I posted yesterday! I'm totally a 'chocolate love' and this is a perfect and most amazing recipe for chocolate cake, that I've seen in a long time. The frosting is superb as well, and coffee addition really puts it way over the TOP! Thanks for sharing your wonderful recipe. It will be a 'staple' chocolate cake recipe in my home! Totally craving you super yummy cake! i know that heat wave song from M.A.S.H! this looks like an amazing chocolate cake! i bet it is utterly delicious with the buttermilk and coffee as ingredients! Looks just fine, pudding or not! And how can you go wrong with more frosting? looks decadent. save me a piece. Ugh, you understand my pain. SF is pretty similar climate-wise to AK in the summer. I can't handle the heat....Got sunstroke every every often before I moved to Germany. That's a good idea--I was thinking of it with a little cappuccino. But German riesling is so dry and lovely that it just might work! Here is Boston, it's been 95+ for the past few days. I haven't even turned on my oven, nevermind baked a cake. I salute your commitment to deliciousness!!! I can't compete with that kind of weather! Stay cool. Hahaha so funny. This cake looks amazing!!! We're having a 75º cold front coming through on Monday...I'm certain everyone will be in sweaters...well, maybe just me ;) This looks like a cake I have to make...and I'm glad you skipped the pudding step...that gives me permission to do so also. Wonderful cake! What a gorgeous cake. 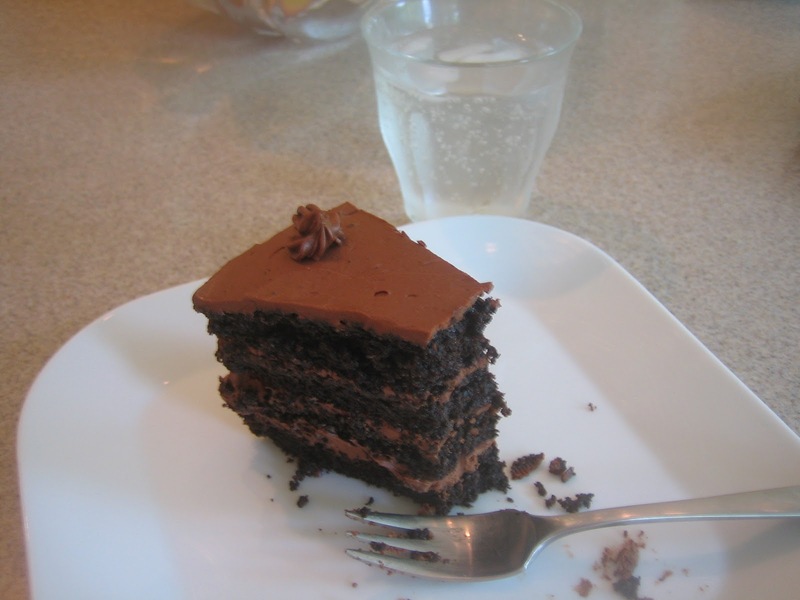 I like chocolate (in moderation) and would love a slice right now with a cold glass of milk, or a hot cup of coffee. It's cooled down to 77 deg F (from the 88-94) we've been experiencing this past five or 6 days so the coffee would be perfect. :) I think a quick trip to the Italian bakery a short distance away is warranted tomorrow as it's already after 7pm ET. I'm envious that you have an Italian bakery! The cake looks really good! Your heat wave story is so funny to me ... here in Denver, CO it has been in the 100s the last couple of days ... My hubby and I are going to move to Alaska someday (family there), and he told me just the other day -- we need to move to Alaska now where it will never be 100 degrees! lol You do adapt to the weather though ... so true! Hopefully it cools down for you! I know, I'm a total wimp to be complaining about 75 degrees. We've been swining between mid 70s and sunny to 60 and rainy for the past couple of weeks, though, and that is tiring. I just saw the forecast for us for next week---104??? Seriously? Love the sounds of that cake---to prep time and the coffee flavoring. Your cake turned out lovely. I refrigerated my pudding before assembling the cake, it made it a whole lot easier. The frosting was a little soft bit I managed to make it work. This looks soo good, I love the name itself! Definitely my kind of dessert, I must admit, I'm intrigued by the whole pudding idea, I must check the original out. Lin, I'm so excited you made the salad! I'm glad it was a big hit with your friends. Seriously thinking of baking this again and only the frosting. Didn't like the pudding filling. Seriously! I thought I left a comment here before! We are experiencing a heat wave too here in Malaysia but this week we have had three thunderstorms saving us from water rationing at the moment!